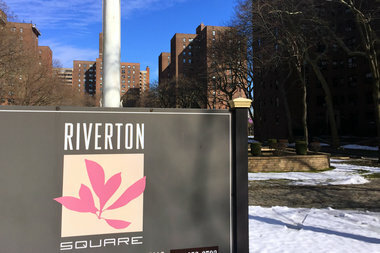 The new owners of Riverton Square said no rent stabilized tenants will lose their status and vowed to create an after-school study center, renovate the basketball court, create programs for seniors, and be more transparent when it comes to repairs. HARLEM — The new owners of Riverton Square promised to bring the historic complex back to it's former glory beacon of housing for working-class families. When it opened in the 1940's African-Americans and Hispanics were barred from other middle-class housing downtown. The development became the home of former mayor David Dinkins and is the current home of State Assemblyman Keith Wright. Brown joined new owner Jim Simmons of A&E Real Estate Holdings to meet with about 100 residents of the complex at 138th Street and Madison Avenue Saturday morning at an event hosted by the Riverton Tenants Association. During the get-together they outlined the terms of the purchase and their plans moving forward, which were negotiated with both the city and tenants association. Simmons told tenants they will build a supervised after-school study center, renovate the basketball court and playground, create programs for seniors and improve the landscaping around the development. He also said all rent-stabilized units will remain rent stabilized and they will hold quarterly meetings with the tenants to review their status of ongoing projects. “I do not want to own anything that or my family do not want to live in ourselves,” he told tenants of Riverton Square. As part of the sale, the developers received about $100 million in tax breaks to keep 975 apartments affordable. The units will be divided into three income levels — a family of three making about $46,000 a year can rent their apartment for $1,100, families earning $62,000 can rent for $1,500 and those who earned about $96,000 will be able to rent for $2,400. “It is a great deal,” said HPD Deputy Commissioner Anne-Marie Hendrickson, who explained the affordability regulations to the tenants at the meeting. As affordable units become available, they will be filled through the housing lottery. Per city rules, there will not be any preference given to current residents. Tenants have had contentious history with previous owner. In 2014 they sued CompassRock Real Estate, claiming the landlord was illegally raising rent of stabilized units and trying to evict tenants who refused to pay the new rents. Although some remained skeptical, many who attended Saturday’s meeting were happy that the owner made an effort to be transparent and speak with them in person. “I can tell you openly and I can tell you definitively that the deal that is in place to protect the tenants of the Riverton — and these are the words from someone at the mayor’s office who does this all the time — is the best deal,” said the tenant association’s lawyer Don Tellock.